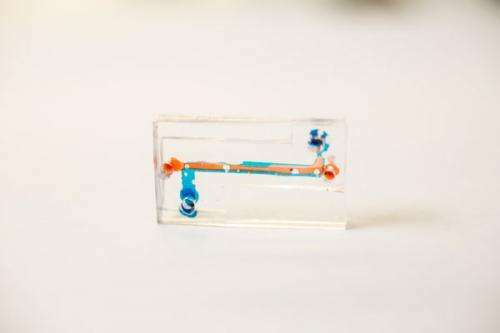 A finger-sized chip will be etched with channels that mimic the branching capillaries of the human lung. And Daniel Ou-Yang, professor of physics, has developed novel methods of using microscopy and lasers, including "optical tweezers," to study the activities of cells at the nanoscale. The project has been supported for more than a year through Lehigh's Biosystems Dynamics Summer Institute, which is funded by the Howard Hughes Medical Institute. The group recently received a three-year grant from the National Institutes of Health. Standard drug-testing methods also have shortcomings, says Lowe-Krentz. Some tests are done in the static environment of cells and cultures, which don't mimic the behavior of the entire organism. Others are performed on animals: this is expensive and the results can be unreliable because a drug's effect on an animal is different from its effect on a human. "The chip enables us to grow our own human cells and observe a drug's effect on them in their natural environment," says Liu. "This will make it possible to do screenings much more quickly and shorten the research cycle." Liu and his students have begun fabricating rectangular chips from a polymeric material that is used as a sealant in solar paneling. Using computer-aided design, they will etch the chips with a pattern that resembles the lung's bifurcating geometry, with channels ranging in width from arteries (about 1 centimeter) to the tiniest capillaries (10 microns). The team will also engineer the chip so that it stretches like the breathing lung. A computer-controlled syringe will control the rate at which the drug is pumped into the chip coating. This flow rate affects cell health and cell signaling. Taken together, says Liu, the design, the elastic chip material and the syringe enable the chip to achieve a credible imitation of human breathing and blood flow patterns. "This will give us a result that is closer to actual clinical studies," he says. The next challenge is to coax human endothelial cells (which line the interior surface of blood and lymphatic vessels) to adhere to, and grow on, the channels of the chip. "Growing cells has been called both a science and an art," says Lowe-Krentz. "As blood vessels develop, a single cell moves out and is followed by other cells. If too many cells follow, they can clog the new branches; if not enough follow, the cells don't cover the surface of the channel." Liu's and Lowe-Krentz's graduate and undergraduate students tackled this task through Lehigh's Biosystems Dynamics Summer Institute. "We've had to trick the cells to behave like we want them to and still have normal characteristics," says Lowe-Krentz. When the chip is coated with endothelial cells, the researchers will treat the cells with a chemical that inflames the cells similar to the way cancer does. They will then inject the device with a blood solution containing nanoparticles hitched with a drug, an antibody and a fluorescent marker. The antibody, a type of protein, will act as targeting agent by causing the nanoparticle to bind only to those cells that express the kind of receptor, or marker, that cancer cells express. When binding occurs, the particles will release the drugs they are carrying. The fluorescent marker will enable the researchers, using scanning laser confocal microscopy, to observe and track the nanoparticles and their interactions with cells. The imaging technique, says Ou-Yang, uses optics, lasers and the computer to obtain a 3-D picture of the entire specimen, from top to bottom. "Confocal microscopy works almost like an MRI," says Ou-Yang. "We scan a plane and illuminate each point of interest, point by point, and then advance to the next sheet and repeat the process. The computer then regenerates these images into a 3-D composite. "We can measure the distribution of nanoparticles in the microfluidic channels of the chip. Because the particles are moving, we do a time average of their motions in the channel to see where the particles are going and where they are attaching." Confocal microscopy will also enable the group to quantify the percentage of the nanoparticles that bind to the cancer-like cells and thus measure the particles' success in finding their targets. The team will also be able to correlate binding effectiveness with size by coating particles of various sizes with different fluorescent markers. In the future, says Liu, the researchers hope to coat the chip with multiple layers of cells with a porous membrane. This will enable them to study how cancer cells metastasize and migrate across blood vessels.